Krishan Vikas made history Wednesday when he became the first Indian to win three Asian Games boxing medals, but ugly scenes erupted after an Iraqi lost a split decision. Bantamweight Jaafar Al Sudani's coach and corner were warned about their behaviour by the International Boxing Association (AIBA) after "unacceptable" protests which led to a supporter leaping barriers into the Jakarta International Expo arena and scuffling with security staff. Local favourite Sunan Agung Amoragam and Iraq's Jaafar Al Sudani had gone toe-to-toe for three pulsating rounds in their bantamweight quarter-final before the Indonesian edged it 4-1 on the five judges' cards. "It is unacceptable. We have to be good sportsmen and accept the decision of the judges," AIBA executive director Tom Virgets told AFP after he had read the riot act to the Iraq team. Vikas, who won gold in 2010 and bronze four years ago, had to draw on all his experience after suffering a nasty cut over his right eye early in his middleweight quarter-final against China's Erbieke Tanglatihan. "It's quite satisfying to come through that and be the first Indian to win three medals," said Vikas after being guaranteed at least a bronze. "Especially as I suffered a serious injury." The 26-year-old fought brilliantly on the counter for the last two rounds as he protected his rapidly swelling eye to edge the fight 3-2 on a split decision. Earlier India's women, without five-times world champ Mary Kom as she focuses on this year's world championships in Delhi, were left empty-handed for the first time since their sport was introduced in 2010. India's last woman standing, flyweight Sarjubala Devi, failed to emulate Kom -- who won gold in the same 51kg division four years ago -- as she lost on points to China's Chang Yuan. Vikas face a tough task in Friday's semi-final if he wants a shot at a second Asian Games gold. Lying in wait is powerhouse hitter Abilkhan Amankul of Kazakhstan, who produced the performance of the day to batter Taiwan's Kan Chia-wei. 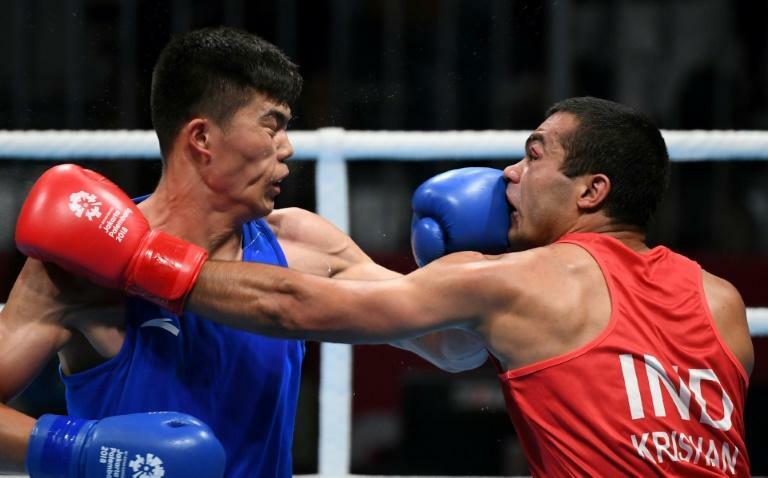 Kazakhstan were the dominant boxing force at the last Asian Games, winning six golds, two silver and two bronzes. But they have punched below their weight in Jakarta with Amankul only one other Kazakh reaching the medal bouts. Filipino 2016 world youth champion Carlo Paalam, 20, pulled off the best win of his senior career with a 4-1 split decision over another Kazakh, Temirtas Zhussupov. Light flyweight Paalam was delighted at securing at least a bronze at his first Asian Games. "Of course it went to a split decision," said Paalam. "He's number one in Kazakhstan. He has fought in the Olympics." Paalam will now face Amit, who goes by one name, for a place in the final after the 22-year-old became the first Indian fighter to book a last-four berth by out-boxing North Korean Kim Jan Ryong. "They motivate me and I learn from them," he said. "Manoj (Kumar)is my room-mate and he shows me how to go about it." India's remaining light welterweight, Dheeraj Rangi, suffered a unanimous points loss to Mongolia's Chinzorig Baatarsukh. Later the Philippines guaranteed themselves at least another bronze when middleweight Eumar Felix Marcial breezed to a unanimous points decision over South Korea's Kim Jin-jea. He will take on Uzbekistan's Israil Madrimov for the right to go for gold.